Rare find, diamond in the rough! One full acre is AG and 3,703 sq. ft designated for Residential. Build your dream home on this property with open level areas (property slopes down in some areas), farm, have a nursery, and enjoy views of the Ko'olau Mountain Range. Also, some areas lend a ocean view. 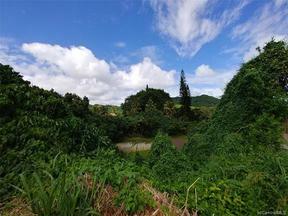 Located in a cul de sac close to malls, stores, restaurants, H1, access to H3, Kaneohe Town. Utilities are available. Paved roads.